The Dublin Regional Meeting will take place on Monday, 22nd February, at 2 pm in Wynn’s Hotel, Abbey Street, Dublin 2. ARCO regrets to inform its members of the death of Brigadier General Patrick (Pat) Mel Dixon of Slí an Aifrinn, Athlone, County Westmeath and formerly of Kilkee, County Clare, peacefully, on Wednesday 7th February 2018 at Stella Maris Nursing Home, Athlone. Beloved husband of Máire and dearly loved father of Tim, Paul, Mary, Kieran, Helen, Una and Padraig. Predeceased by his brother Seán and sister Mary. Sadly missed by his adored grandchildren Miriam, Conor, Brian and Rory, his brother-in-law, sisters-in-law, sons-in-law, daughters-in-law, extended family and wide circle of friends. Reposing at Flynn’s Funeral Home, The Strand on Friday evening from 4.30pm with removal at 7.00pm to Our Lady Queen of Peace Church, Coosan arriving at 7.30pm. Requiem Mass on Saturday at 12.00 noon followed by burial afterwards in Coosan Cemetery. 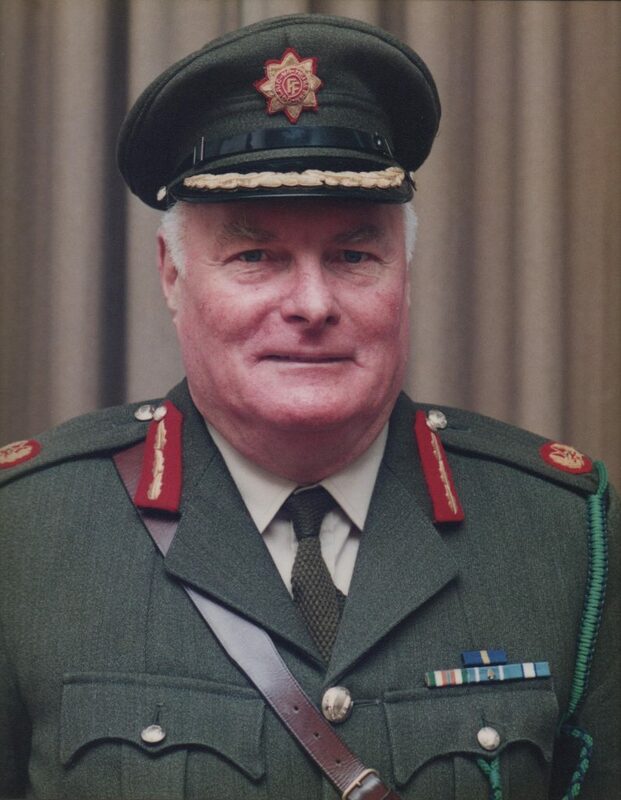 Pat Dixon was a member of 22nd Cadet Class (1949 – 1951) and was one of the Defence Forces’ first peacekeepers when he served with UNOGIL in Lebanon in 1958. He was appointed General Officer Commanding Western Command in August 1989. ARCO regrets to inform its members of the death of Captain John McGlinchey, late of Letterkenny, County Donegal. On January 12, 2018 peacefully, at his home in Harare, Zimbabwe with his loving daughter Afric by his side. Survived by his brother Fr. P.J. McGlinchey in Jeju Island, Korea. Beloved father of Afric, Ian and Paula, adored grandfather of Kalai, Joe, Micaela, Tadhg, Cian, Ciara, and Nathan, proud great-grandfather of Benjamin, loving brother-in-law of Ursula, Basil, Liz, Sheelagh, Marine. Sadly missed by his nieces, nephews, cousins and dear friends. John was a member of the 27th Cadet Class and served in the Western Command, before retiring from the Permanent Defence Force and moving to Zambia in the 1960s. A funeral Mass will be held at the University Church, 87A St. Stephens Green, Dublin 2, on Friday, February 9, at 12.00pm.